I did this quick and easy rose gold eye makeup look with foil eyeshadow - this was the first time I played with foil eyeshadows, and boy, AM I impressed! They are so creamy, glide on so well, and are easily blendable. Not to mention how opaque they are, and how they last even without primer. The only problem is that you may have to use your fingertips to pat or glide them on, rather than a brush. Or maybe a very stiff-bristle brush could do the job; since I've gone out of my way to buy only soft-bristle brushes, I cannot prove this theory. You can wear this look to daytime parties over the Holiday season; it's just about subtle enough! Enough of that, though - the tutorial is right ahead. 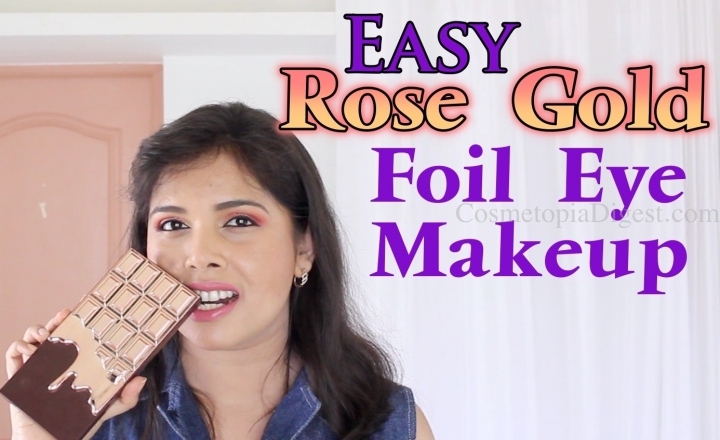 Scroll for an easy-peasy rose gold makeup look with foil eyeshadow. For the full tutorial, watch my short video. Please do give me at thumbs-up, and do subscribe to my channel! Review of this palette is coming up in my very next video - do stay tuned!